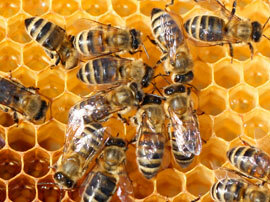 Honey Bees: Honey bees are social insects that live in large colonies. They play an important role in their local environment by pollinating flowers and local agriculture. Honey bees are often feared for their sting, because their stinger and often their venom sac and other parts of their anatomy are torn from their bodies when they sting. This is because their stingers are barbed, unlike wasps, so they become attached to their victim. Africanized Honey Bee: Africanized honey bees have become notorious in recent years due to their aggressive nature. Africanized honey bees are a result of mating between European honey bees and an African species. These bees are more aggressive than honey bees and they are attracted to loud noise and vibration, as well as large, dark-colored moving objects within 50-150 feet from their colony. Noisy lawn mowers or tractors can cause a swarm of Africanized honey bees to attack. Multiple stings can be fatal. Carpenter Bees: Carpenter bees are similar to termites in that they bore holes into wood and cause structural damage. They are commonly found in forested areas and around foothills of mountains. They are not known to sting humans, but their wood boring activities have been known to ruin decks, railings and outdoor furniture. Bumble Bees: Bumble bees are large bees with dense hair that helps them pollinate flowers and agriculture. These bees are typically black with only one or two stripes of yellow. Bumble bees tend to nest in the ground, piles of wood, or long grass. Sometimes they will occupy abandoned bird nests or patio roofing. Like wasps, bumble bees have the ability to sting more than once. Their stings may not be fatal to most, but for those with bee allergies, they may cause anaphylactic shock. Pest Innovations technicians are all state licensed, trained and certified in Africanized Honey Bee removal. We offer removal of the hive as well as treatment for Carpenter bees. When possible we also offer a guarantee on our bee removal services. For more information about bee hive removal, call us today!